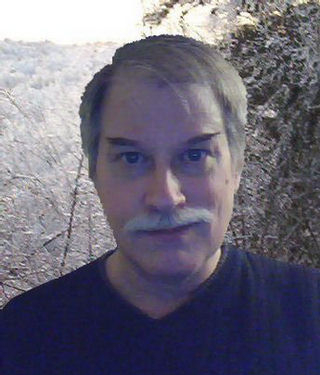 Carl “Bear” Bussjaeger is an ex-writer; author of Net Assets (2003 Prometheus nominee), its sequel Bargaining Position, and the short story collections Th e Anarchy Belt and The Anarchists. He wrote fiction and nonfiction, drew cartoon strips, and generally annoyed people literally since the 1970s until he gave up in 2012. More personally, I’m in my early 50s, six feet tall, a bit stocky, have brown hair; generally shaggy in the winter, buzz-cut in the summer, blue eyes. I tend towards libertarianism (but decidely not Capital-L Libertarian Party), and find New Hampshire’s state motto suits me well enough. I also come equipped with a twisted sense of humor that baffles a lot of people; m’bad. Over the years, I’ve done a bit of everything: 11 years in the US Air Force, a year as a Correctional Officer, a few telecomm outfits, writer, freelance electronics tech, caretaker, private security officer, magazine editor, proofreader/editor, commercial graphics artist, investigator, construction worker, retail sales, web designer… I get around. My hobbies are varied, as well. I (used to) enjoy writing; both SF and how-to articles, along with the occasional cartoon and political/social commentary. I’m interested in medieval history, which led me to the Society for Creative Anachronism several years ago. But I despise pointless bureaucracy, which in turn eventually caused me to quit the SCA. I also shoot, brew beer and mead, do metalwork, leatherwork, make paper, armor, weird gadgets, and garden. I’m a strong proponent of space exploration and development; but believe it should be done by individuals and private industry, rather than by governments. My take on this is pretty well illustrated in my novel Net Assets. I am very much “into” self-sufficiency, and I’ve acquired a broad range of skills to achieve it. Most folks who really know me consider me to be an effective jack of all trades. I’m old-fashioned in that I still believe that a man’s word is his bond. If I make a promise, I keep it. I used to have grandiose dreams. I imagined selling some SF, being a lower-B-list writer, getting a few fans, maybe even an invitation to a small local con. Eh. Heinlein said something to the effect that good writing is that which people will pay for. My dreams became a little more mundane. Holding down a decent job, buying a few acres of rural land, writing a little on the side. Enjoying life. Then I just wished I could afford a little fixer-upper house, and fall in love with a nice lady, raise a little family. These days… I wish I could pay my bills, afford some ground beef or chicken a couple of times a year. Maybe even a bottle of scotch. That would be luxury. No, even a bottle of the cheapest vodka would qualify as luxury. Not sure when I could last afford beef or booze, but it’s been a couple of years. Hi Carl, I found your blog through the Simon Jester Project. I was wondering if you’re still doing anything with that site? It seems a bit antiquated, and I’d like to contribute some new content/get rid of that awful comic sans font if possible. Hi Carl, I’m currently re-reading ‘Net Assets’ in .pdf format I appear to have found on your site years ago. If I remember correctly, a few years ago I even managed to send you a few FRNs in appreciation. Have no idea when it was, and if, again, I remember correctly it was anonymous cash ($20-30). My point, and I do have one, (to steal from Degeneres) is that in trying to find your site I found ‘Net Assets’ on Amazon, apparently the unauthorized version. What I wanted to ask you was, if I had found the ,pdf file again on your site, if I could publicize it (along with your mid-point request for remuneration) on Facebook. If that is no longer available, as might be the case, then I will attempt to find the authorized distribution point and point my ‘friends’ in that direction. With a little luck you’re still reading this. I have enjoyed your work. Thank you. I’m currently reading Net Assets, and I must say, it is superior to Atlas Shrugged in every way. Yet what I wanted to ask you about was if there were a theme song to your novel, what do you think that would be? Just as Atlas Shrugged has “The John Galt Theme,” and Alongside Night has the “Alongside Night Theme,” may I suggest Carl Stuvek’s “The Prodigal” as a candidate for the theme of Net Assets? I figured a more bluegrass theme was more appropriate, since it appears that the majority of the novel takes place in Texas. In the Powerball-scale unlikely event NA needs a theme song, three tunes come to mind. I’m not familiar with Stuvek, or “The Prodigal,” and a quick casual search didn’t turn up that song.